Dental crowns have held a common place in restorative and cosmetic dentistry for decades. Dental crowns are essentially prosthetic caps that are placed over a tooth. 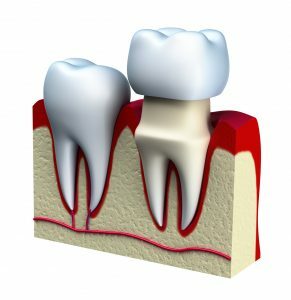 Most often, when you think about dental crowns, you think about their use in combination with root canal therapy or to fix a tooth that has become severely damaged. However, dental crowns can be used in combination with a number of other dental procedures, such as replacing missing teeth with a dental bridge device. It is estimated, 15 million Americans choose a crown and bridge to replace missing teeth because it is an affordable and effective solution. Blanco Circle Dental Care offers the dental crowns in Salinas for a variety of purposes. There are a wide ranges of situations that may require the need for a dental crown. Often, when a tooth has become severely damaged or weakened, a dental crown is placed over the tooth. By placing the crown, the tooth’s health, function, and appearance is restored. In addition, dental crowns are often used in combination with other dental procedures, such as root canals or dental bridges. When used in combination with a dental bridge, the dental crowns anchor the device in place by attaching the crowns to the adjacent teeth. In the past, dental crowns were considered to be an eyesore because they were made from dark metals. However, now dental crowns are often used as part of cosmetic services as well because they look like natural teeth. Using porcelain and all-ceramic restorations allows your crown to be customized to meet the exact size, shape, and color specifications needed for a restoration that looks like your natural teeth. No matter the reason a dental crown is needed, the procedure to receive the crown remains the same. Dr. Gary Klugman remains current with the latest advancements in dental crowns through continued education. His extensive training allows him to provide high-quality, reliable, and durable restorations that will withstand the test of time. Most often, the process to receive a dental crown requires two separate appointments. During the initial visit, your tooth will be prepared for the crown. This involves reshaping the tooth to ensure a secure fit for the dental crown. After the tooth has been prepared, images and impressions of the tooth are taken, which are needed to create your custom crown. These images and impressions are then sent to a professional dental lab, where your restoration will be made. While you wait for your new crown, a temporary crown will be attached to the tooth. Once your restoration is ready, we will remove the temporary crown and bond the permanent crown to your tooth. At Blanco Circle Dental Care, we provide the high-quality dental crowns needed for a wide range of situations. No matter if you need a bridge and crown or the health of a damaged tooth restored, we have the solutions you need. Contact our office today to learn more.